Now it’s not that we ever expected anything inventive from the live movie adaptations of the ONECHANBARA franchise, quite the opposite: if anything, the ONECHANBARA movie had to rock, and it was very disappointing to see the first installment fail so miserably. ONECHANBARA: THE MOVIE was a timid, half-hearted attempt to bring the essentials of the game, namely blood, guts and heroines in skimpy outfits, to the big screen. It was unfinished business, a rushed, sloppy video-game-goes-J-splatter exercise, and surely one of the most dissatisfying genre movies of that year. ONECHANBARA: THE MOVIE – VORTEX must therefore be considered one of the few sequels that actually correct most of the mistakes of the original film. That is even more surprising as it is a direct-to-video release. Just about everything turns out to be better though: from production value to the story, the action choreography to the dialogues, ONECHANBARA: THE MOVIE – VORTEX is far more solid, thought-out and homogenous, or simply speaking, it’s outright fun. Nothing spoils the viewing experience (like was the case with the predecessor), but just don’t expect a new genre milestone: this is still action on a shoestring budget, but they know how to work around it this time. Take the special effects, for instance: hardly any physical “blood” is spilled, most of it is CGI, based on a conceptual post-production approach, but it has impact and gets the job done in high-paced fashion. The bottom line: if you had to pick one of the ONECHANBARA movies, make sure you avoid the first one and skip straight to ONECHANBARA: THE MOVIE – VORTEX. What would we all do without today’s technologies? Probably talk to real people, have a real conversation, have real get-togethers, and miss out on all the junk distributed via MMS and internet, including disturbing images that could lure us out into the woods. It’s interesting to compare a terror flick like MAN HUNTING to, say, FRIDAY THE 13TH: back in 1980 it was kind of the idea to keep the victims isolated, contain the murders, control the space and ensure its functionality in the future. Just like Norman Bates in the 60s, the killer had to leave no trace if it was his goal to do it all over again. Today, it’s the killer’s goal to tell the world about it. How pathetic; I thought gentlemen don’t brag. The good old killer etiquette is dead: they are not killing for their own pleasure anymore (or dead mother), they are killing for the public (and very rarely only that means pleasure as well). MAN HUNTING is no DEATH TUBE, but the story wouldn’t develop the same way without multimedia mobile phones. Not that this makes the film any better or worse than it is. The story is a lame attempt to justify misogynistic torture scenes that are embedded in plot extracts from movies like BATTLE ROYALE, SAW or ALL NIGHT LONG. I am not sure why some filmmakers think doing the same thing others did before – just worse – would be sufficient for any audience out there (but maybe the V-audience is really that undemanding). 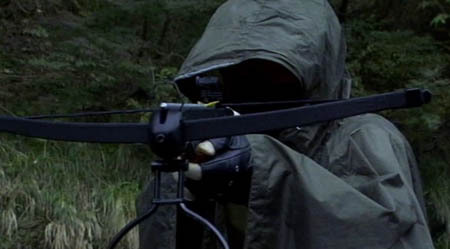 In principle, MAN HUNTING could have been an ok genre flick if it wasn’t for an irrational storyline and an outstandingly inelegant execution. Some movies are gross, some are weird, some are raw and realistic, but MAN HUNTING most of all is clumsy. Not only the direction and editing are clumsy, but the special effects: if you have ever watched a making-of by Tom Savini, or any other FX guru, you’ll be laughing out loud seeing many of the wannabe gruesome effects. A movie that has barely anything else to offer is digging its own grave displaying poorly executed scenes of violence. The only effective scenes are those copied from other films, yet MAN HUNTING never achieves the same level of quality. With clearly less than 90 minutes of running time MAN HUNTING is best suited as opener for a movie night, or downer early in the morning when many are on their way home, or asleep. The only thing MAN HUNTING is killing is time. An “entertaining” movie he wanted to make, Takashi Kitano said about OUTRAGE. A movie with no other ambition than that, a movie not even marking a return to the Yakuza genre. Something quite different from the preceding films. In many ways OUTRAGE quite well corresponds to Mr. Kitano’s intentions. 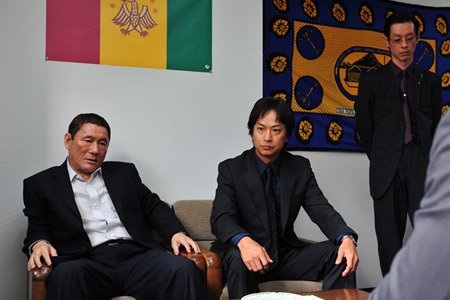 It was Mr. Kitano himself who delivered the swan song of the Yakuza movie two decades ago – interpreting OUTRAGE as a movie depicting a changing world where the old code of honor is worth nothing would mean to ignore the oeuvre of Mr. Kitano (as well as that of many other directors). Hailing OUTRAGE as a milestone of the genre, or as an epic story about the system individuals operate within, as well as the rules they abide by, would be nothing but evidence of ignorance. Watching OUTRAGE is a bit of a time machine experience: we are revisiting places, characters and motifs of Mr. Kitano’s milestones, all amid a permanent conflict of signals the film sends. Is that shirt or that suit actually from the 80’s? But then why is that car from the 2000’s? There are obsolete characters in a modern world, and then there are contemporary characters in an obsolete world. It’s a constant struggle, also for the writer-director Takeshi Kitano. It seems like the cast from VIOLENT COP was beamed into modern-day Japan. But what exactly is the difference between now and then? What has changed? Not much, I have to say. People kill for money, or for revenge, or for power. At some point Mr. Kitano rephrases the motif for violence as being “career”: a term that fits to times like these, where people spend 80% of their time on playing politics in corporations, positioning themselves and lying their asses off, while only spending 5% of their time actually working (the other 15% are spent on facebook @work). Nevertheless, climbing up the social ladder is what it’s always been about, and the way to get there doesn’t differ much from how it happened in Mr. Kitano’s earlier films. The permanent betrayal is nothing but an amplification of what we have seen before, and it much more has become a means of dramaturgy that drives the film forward than it being the actual subject of the movie. Betrayal doesn’t indicated loss of values in the Yakuza universe anymore, it merely indicates plot points. For Otomo (or whatever he was called before) things don’t change however, and he doesn’t participate in change. Change is for the others. Betrayal comes as a surprise. He is a guy who cuts his finger off first and only later finds out that he did it for someone who deceived him. And he hasn’t realized yet that cutting off fingers just doesn’t cut it anymore anno 2010 in the first place. What makes him an anachronism also makes him the biggest threat to the “career Yakuza”: he doesn’t live for tomorrow, he lives for the past. The good old days are preserved within the Otomo character as he acts by their rules and their ethics and applies that school of thought to a world that has evolved. Otomo doesn’t oppose progress (he doesn’t care enough about it), but he is the force that prevents it from happening (even though the world moves on without him finally). What Mr. Kitano doesn’t make clear is if OUTRAGE now is a statement for or against progress, or if it just laments that the world changes indeed with or without us, or if it’s an advice to adapt or if it’s about the survival of the fittest, whatever that means at a specific point in time. Maybe OUTRAGE is a melancholic statement that there’s nothing left worth fighting for, or it’s the same statement made before, that idealists are a dying breed. But most probably it’s none of the above, but instead what Mr. Kitano set out to do in the first place: rock-solid entertainment that plays with genre conventions rather than making any statement or providing any new insights at all. 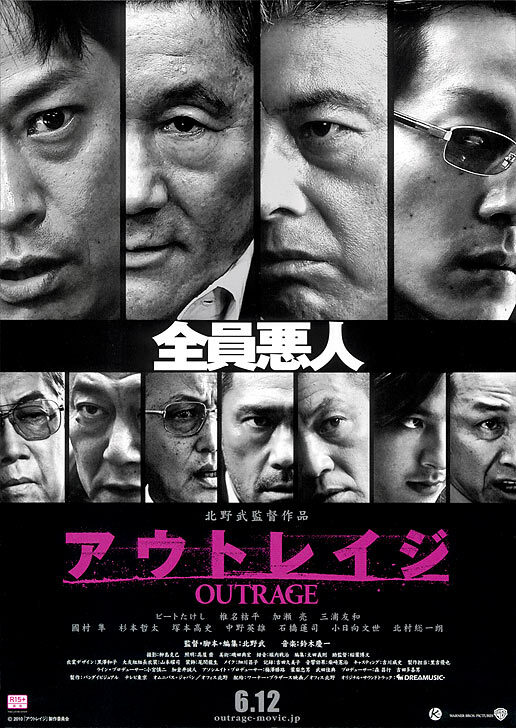 OUTRAGE, maybe for the first time, is really a genre movie, not the genre-bending Kitano movie we all know.